I love a great red carpet event and I love it even more when I get to dress up somebody who is attending! This time, I had the pleasure of frocking up Rochelle Noll, the wife of the one and only Shannon Noll.They attended the Dally M Awards on the 29th of October and joined the force of amazing fashion moments. 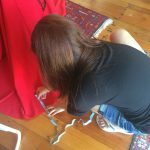 I captured a few behind-the-scene pics of Rochie’s fitting with the amazing Betty Tran (a Perth-based designer) in the lead up to the big night. You would have to agree that Shannon and Roch make a very handsome couple. 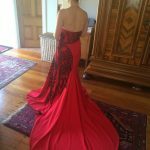 And the DRESS – wow! Betty Tran – you’re amazing! 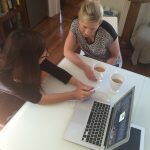 Rochelle meets with Betty to talk designs for the first time. Ready for the red carpet – what a stunner! Tags: Betty Tran, Dally M, DallyM, Fashion, Perth, Red Carpet, Rochelle Noll, Shannon Noll.